What is not started will never get finished. Do you have a list of things that you really really want to create, paint and craft? I do. My list is veeeery long, and always growing (this is just one part). I guess that this is why it sometimes takes me years to find time to get to some projects. I’d like to do more of what’s on those lists, to check of some of the craft ideas. Especially when it comes to awesome projects that has been percolating in my brain for years! They need to come out! True with the DIY Planner Pages, something that I wanted to share with the world two years ago but never got around to finishing (until now!). Well, it’s 2014 people! Now is the time to make time! And today it’s time for a cute wool owl! Don’t you agree? Hello little darling, welcome to the world! Recycled Sweater Owl #1. 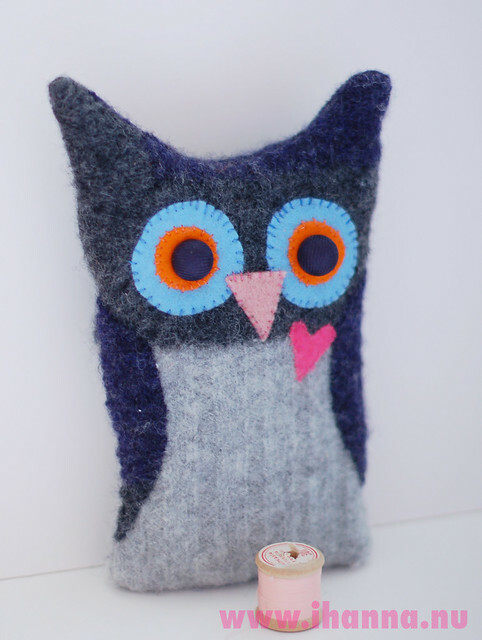 I always envisioned my owl a gray one, made from the felted wool sweaters I have in my stash. 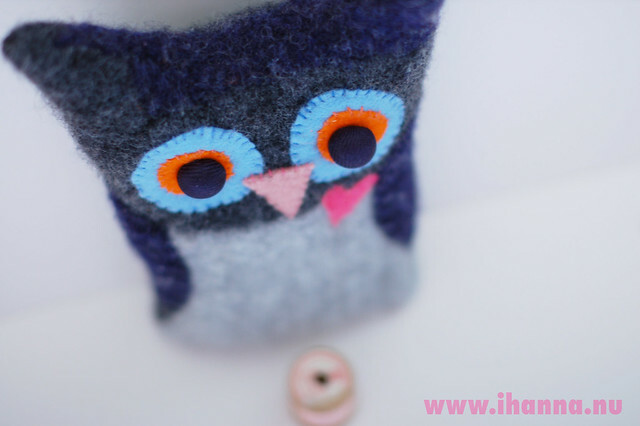 And finally I created the very first one in a series of awesome wool owls! I love using recycled materials. Felted wool from knitted garments is perfect for softies, because it creates a thick fabric, soft like butter and lovely to sew with. This owl has baby blue eyes and a big heart ready to burst with love. The eyes are made out of vintage fabric buttons that are almost round. I knew right away when I found them that they’d make perfect eyes for a creature of the night… A Wool Owl. This one is called Number One. A few of his compades will be blogged later on, and added to my Etsy Shop. You can sign up for my newsletter if you want to know when, but first, leave a comment and let me know if firstborn isn’t the cutest owl you have seen all year? This entry was posted in Fabric & Sewing, Thrift & Recycle and tagged owls, recycling, REpurpose stuff, softies, wool, wool owl. Bookmark the permalink. Number One is definitely the cutest owl I have seen all year :D Can’t wait to see what his siblings will look like! Your owl is adorable, Hanna! The problem with those lists of projects I want to do is that they keep growing by the day! So many wonderful ideas out there… I just keep pecking away at it. Wise words from Goethe, by the way. Oh, it really is…and I know all about those lists! I immediately jotted down the Gouthe quote in my journal. He’s too cute. A true inspiration as this year I intend to begin my own family of soft and fluffy creatures. Wow! I love your DIY-inspiration mosaic. Very very inspiring! Thanks for sharing this. And your planning calendar. Simply great! Very cute. I’ve been wanting to create an owl. Now I really want to make one!